MaD - In Z whenever you captured a flag you'd also capture its facory. That promoted many interesting and thrilling gaming situations, when you'd keep an eye on the factory production timer and try to capture it right on time. What were the design decision behind moving the capturing function to a unit? Now that the game is done, do you still feel that was the right decision? Mike - One of the early design decisions on the game was to alter the territory model to introduce the cash element. Once we'd done that, having control of facilities pass with the territory became inappropriate. If we'd have kept that in, money would never really have become an issue, as any decrease in money would have been met with a similar decrease in your ability to spend it! Also, because we'd added the ability to build your own factories, it would be possible for the game to get into a situation where one territory bacame overidingly important, going against the idea that the game uses every inch of the map. So, while nicking territories just as a unit was about to pop out of a factory was great fun in Z, it just didn't fit in with what we had in mind for Steel Soldiers. MaD - Would a classic game mode be possible? With many Z players missing the original, it'd be great to have a game mode with visible factory level (according to terrain flag) and timer, robots slowly crossing water and factories capturable through territory capture. Any chance? Mike - Not really. The classic mod of play would only really work on the original Z maps - the ones from Steel Soldiers wouldn't really fit the purpose without some substantial reworking. 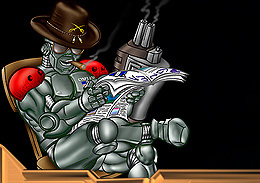 There are also a lot of other things that were inherent to the original Z that are done totally differently in Steel Soldiers, so it certainly isn't a trivial task. Besides, the original Z can be picked up for a couple of quid now if you hunt around, and it's still as enjoyable to play as it was back in '96. MaD - Last, but not least, do you think Z:SS turned out to be all that you originally envisioned? Ie. was it intended as a Z in 3D with more units and options, or as a totally different game as it turned out to be? Mike - Steel Soldiers was always intended to be different to the original Z, it certainly wasn't just meant to be "Z in 3D"! Even so, the end product turned out differently to the original plan for the game - some elements are probably more Z-like than what we originally went for, whereas other elements were taken even further. Trying things was important all the way through the game's development, and because of this it probably ended up better than our original plan. and brilliant track of great gameplay games.